Welcome to SGBASED Store, Are you still looking for novelty license plate to decorate your car? Our license plate will make you satisfaction! 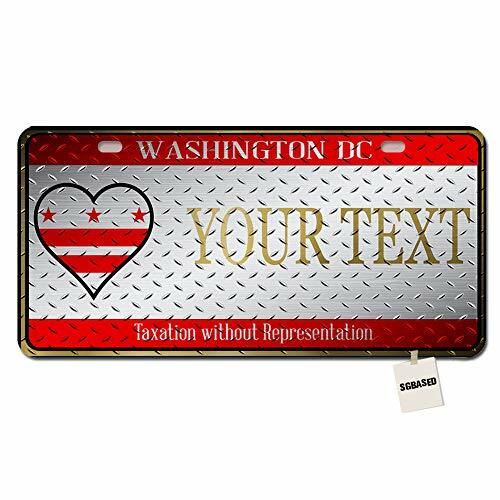 This license plate with stylish element and fashion text, it is a perfect addition to your own car. Support to customized your own text or name. it is a good gift for your friends, it is also a great souvenirs for your Friends/Family or Home/Office decorative accessories. All of designs are made by SGBASED! This novelty license plate is only sold by SGBASED Store, please purchase this license plate in “SGBASED Store” to guarantee authenticity.EASY-TO-Customize: Please Click on “Customize Now”, Custom Any Text You Want, The Font of this License Plate is designed according the Main Picture, If you want Other Fonts, you can write email to tell us! BEWARE OUR BRAND: This novelty license plate is only sold by SGBASED Store, please purchase this license plate in “SGBASED Store” to guarantee authenticity. Material: License plate made of metal material, the surface of the license plate is smooth. SIZE: 11.8 X 6.1 inch with 2 Pre-filled holes. Perfect Decoration: It is a good gift for your friends, it is also a great souvenirs for your Friends/Family or Home/Office decorative accessories.